Doctor advises a patient on a phone. Telemedicine and telehealth flat concept illustration. Man hand, smartphone, heart with pulse on a screen. Vector element for tele and remote medicine infographic. When it comes to healthcare and technology there are a lot of terms that are tossed about, sometimes they are very similar, and some are even used interchangeably. This can be very confusing for both patients and providers. 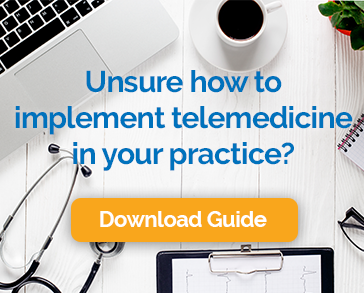 The term “telemedicine” is among those that are not always clearly understood, so we thought we’d take a few minutes to offer a full and accurate, but easily understandable definition. Telemedicine refers to the use of telecommunications hardware and software to assess, diagnose and treat patients at a distance. It has has been around for decades in, but until recently only used in a limited capacity. These days, it is rapidly becoming an important and ordinary channel of healthcare delivery in the United States. Telemedicine is not considered a distinct medical specialty. Instead, it is a means of providing clinical care that can be used by many types of providers from family medicine physicians, to radiologists, oncologists, and other specialists. Telemedicine includes patient consultations conducted through audio and video conferencing, remote monitoring, nurse advice lines, image transmission, and test result reviews. Although the terms telemedicine and telehealth are similar and sometimes used interchangeably, telemedicine is actually a subset of telehealth. Telehealth includes non-clinical activities like medical education, physician training, and administrative meetings. Both telehealth and telemedicine belong to an even larger range of technologies known as Healthcare Information Technology (HIT), which also includes patient management systems and digital medical records. There are three different categories of telemedicine. When you think of telemedicine, you might imagine a patient sitting at home talking to their doctor using an internet-based video connection. This is called real-time telemedicine. We sometimes refer to it as remote visits or video visits. This approach can take the place of an in-office visit for appropriate cases. In many cases, providers can be reimbursed by private insurance for this type of telemedicine at the same rate as an in-person encounter. Store-and-forward telemedicine is technically “asynchronous telemedicine.” It allows healthcare providers to share patient medical data such as lab reports, images, videos and other records with providers at different locations. It’s much like email, but with sophisticated, advanced security features to ensure patient privacy and compliance with regulations like HIPAA. Store-and-forward is a useful way for patients, primary providers, and specialists to collaborate because they can each look at the information when it is convenient. Several specialties, including radiology, dermatology, and ophthalmology commonly use store-and-forward technologies for treatment and diagnoses. Remote patient monitoring, which is also called telemonitoring or home telehealth, is a category of telemedicine that helps providers track patient vital signs, activities, and other health-related information from a distance. This is especially effective when caring for high-risk patients, like people with cardiovascular problems, the elderly, or those who have recently been released from the hospital. Remote patient monitoring is also frequently used for the treatment of chronic conditions. People with diabetes, for example, can easily send their glucose levels to their doctor for evaluation. Patients in assisted living facilities or elderly patients at home can be treated at a lower cost than in-office or physical in-home care. A video visit using high definition video and audio conferencing can sometimes replace an in-person visit to the doctor’s office. The patient and provider interact using a software application designed for the purpose and the patient’s own computer or mobile device with internet access and an HD camera. The patient can conduct the visit from anywhere that offers enough privacy. Telemedicine can also connect patients with the expertise of specialists who are not physically in the room. The patient may be in the office of their primary physician when a video visit is conducted or they might be alone at home. In some cases, the primary physician may use the store-and-forward technique we described above to provide relevant information to the specialist for evaluation. Stand-alone urgent care clinics and traditional physician’s offices are turning to telemedicine to provide urgent care services. Many urgent, but non-emergency cases can be safely and effectively diagnosed and treated with a video visit, reducing emergency room crowding. Telemedicine is perfectly suited for psychiatric services including cognitive behavioral therapy. In fact, it has been proven to be as effective as in-office care for the treatment of depression in veterans. We hope this deep-ish dive into the meaning of telemedicine has been helpful. If you’d like to learn more, or if you’d like to see a telemedicine solution in action, just drop us a line. We’re happy to help.